Editor’s Note: This product has been discontinued. I recommend you check out our Best Sous Vide Reviews page to see an alternative option. In this review of the Figerm Sous Vide Cooker, we will be taking a look at all of the features and benefits of this sous vide immersion circulator. The pros and cons of the Figerm Sous Vide Cooker will also be analysed from real customer reviews. The Figerm Sous Vide Cooker is a fairly new arrival to the sous vide cooker market and has made quite an impact. It is a versatile immersion circulator, with a high power output that will cook your food perfectly. It has a stylish design and will blend in well with any kitchen. It is a competitively priced sous vide cooker that offers a lot of features. The Figerm Sous Vide Cooker operates with a standard 120V electrical outlet, and the heating element can generate 1100 Watts of power. The power cord is removable for storage flexibility. This extra power means that the water in your water bath will heat up faster than it will with other sous vide cookers. Despite the large power output, the immersion circulator runs quietly and efficiently. This immersion circulator sous vide cooker has been built with safety in mind. There is an overheating protection feature as well as a dry heating protector. There are minimum and maximum water level marks, and if the water level falls below the minimum level then the unit will power off automatically. This is an essential feature, as the water level being too low can cause a serious accident. This means that you can leave the Figerm Sous Vide Cooker to cook without watching it. If the water in your cooking pot evaporates to a really low level, you will know that the cooker will switch off automatically to prevent any problems. The Figerm Sous Vide Cooker is produced in a stylish white color and looks good. 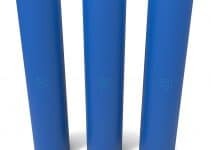 It is a small unit measuring 15.6 inches in height, 7.3 inches in depth and 5.5 inches in width. It only weighs 5 pounds, so it is easily portable. This sous vide cooker is made of materials that are heavy duty, and the build quality is best described as solid and durable. The immersion circulator has a strong clamp at the back of the unit, and this is designed to fix securely to a cooking pot of almost any size. It is designed to stand up in whatever cooking pot you attach it to. 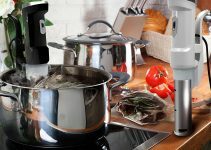 The Figerm Sous Vide Cooker can operate effectively with a water bath filled with up to 22 liters (5.8 US Gallons), which is sufficient for most home cooking. All that is needed to cook delicious sous vide food is a suitable water container that can withstand heat. The clamp is easy to use and will provide a secure connection with the water container. In order to cook perfect sous vide meals it is essential that the sous vide cooking equipment has good temperature control and stability. The Figerm Sous Vide Cooker scores very well in this department. The temperature is accurate to within ± 0.1°C. The cooking temperature range of the Figerm Sous Vide Cooker is also impressive. You can set the temperature from 0°C (32°F) up to 90°C (194°F). This will cover the majority of sous vide cooking temperatures. The unit provides even circulation of the heated water at all times, so that you will get the results that you are expecting every time. The sous vide cooker has a large, touch button, LCD display which is well illuminated and looks good. The display unit can be seen from some distance away in all lighting conditions. It also provides the controls required to operate the cooker. At the top are the temperature and time displays. It is possible to display the cooking temperature in either Fahrenheit or Celsius and this can be changed at any time. There is a temperature setting button for selecting the desired cooking temperature. A lot of immersion circulators do not have a timer, but the Figerm Sous Vide Cooker does have one. The timer can be set from 0 to 99 hours and there are two buttons that you can use to either increase or decrease the amount of time set. The buttons all have a solid, positive feel to them. The LCD display also includes an on / off button to switch the cooker on or off (can also be used for starting and stopping the cooking function), Celsius and Fahrenheit symbols (one will illuminate depending on which range has been selected) and an “in use” symbol. “It’s a great product” – the majority of the customers that bought the Figerm Sous Vide Cooker thought that it was a very good product. One customer said that their family will now be eating healthily with the sous vide cooker. “A great addition to any kitchen” – a number of customers liked the design and ease of use of the cooker. People commented on how “excited” they were to have purchased the machine and were looking forward to cooking some great meals with it. “The motor is super quiet” – there were quite a few comments about how quiet the heater and water circulator were on this best sous vide machine. 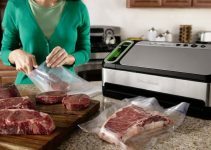 “It fits securely to the cooking pot” – it was stated that the Figerm Sous Vide Cooker has a secure clamp that fits securely to the pot being used for cooking. There was also a comment about the power cord never getting wet because of its location at the top of the unit. “Extremely tender chicken breast” – people commented about the results that they had achieved from cooking different foods. One person said that the immersion circulator had cooked the tenderest chicken breast they had ever tasted. The Figerm Sous Vide Cooker is a fairly new immersion circulator and for this reason there were hardly any negative reviews. “It’s a fire hazard” – one customer stated that the Figerm Sous Vide Cooker did not have any temperature control and was a fire hazard. None of the other customers commented on this, and this could have been a faulty unit that should have been returned. The Figerm Sous Vide Cooker received 5 out of 5 stars from 66% of the customers that left reviews. Being a new product there were not that many reviews, but the majority were positive. The negative reviews are not considered to be major issues. Overall the Figerm Sous Vide Cooker is a good immersion circulator that will produce high quality sous vide cooking results for you again and again. It is available at a good price, and will work with most cooking pots. This sous vide cooker is recommended.